Jerusalem - As a member of the largest Jewish religious community in Jerusalem, Yossi Daitsh should have a big lead in the holy city’s mayoral election race. But Daitsh, an ultra-Orthodox Jew and Jerusalem’s deputy mayor, is trailing three more liberal candidates ahead of the Oct. 30 ballot, when municipal polls are held nationally. Some political analysts see that as a sign the ultra-Orthodox - known in Hebrew as “haredim”, or piously “awe-struck” - feel freer to vote according to personal preference and independent of their rabbis’ rulings. If so, the Jerusalem mayoral race could be a bellwether of ultra-Orthodox integration in wider Israeli society, where welfare benefits and military draft exemptions for the community have long been resented by the secular middle-class. 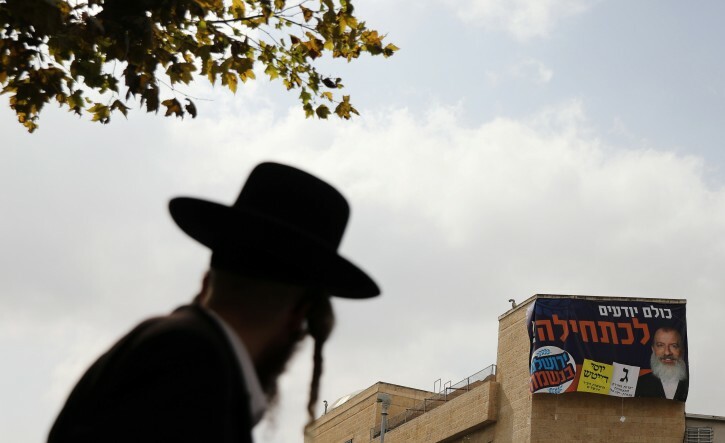 But reluctance among the ultra-Orthodox to rally around any single candidate also points to long-standing political splits among the community’s three main streams in Jerusalem, which has had only one haredi mayor, from 2003 to 2008. Yair Ettinger, a scholar with the Israel Democracy Institute and the Shalom Hartman Institute, said ultra-Orthodox society is at a turning point, with some members breaking away from rabbis’ rulings, and “this may well manifest in the Jerusalem election”. Ultra-Orthodox men have traditionally stayed out of the military and workforce by devoting themselves to full-time religious studies. That has raised concern that a lack of skills within the community will ultimately harm Israel’s long-term economic health and many Israelis would rather see them integrate into mainstream society. Fuelled by high birthrates, the ultra-Orthodox make up 10 percent of Israel’s majority Jews, and more than triple that - 36 percent - in Jerusalem. In the Jerusalem municipality’s administrative city council, haredim hold 14 of the 31 seats. One survey, on Oct. 12, predicted that could drop to 8 in the upcoming vote - indicating a shift of haredi support to non-Orthodox party lists. Twenty-one percent of Jerusalem Jews are secular, like the election frontrunner - former Deputy Mayor Ofer Berkovitch - and the outgoing incumbent mayor, Nir Barkat. Another 43 percent are non-haredi but religiously traditional. Palestinians, who make up a third of Jerusalem’s population, are mostly boycotting the election, as they have done for decades, in protest at Israel’s occupation of East Jerusalem, seized in the 1967 war. Black-coated and heavily bearded, Daitsh, a 50-year-old grandfather, has cast widely for votes. His online biography plays up his years of army service, a haredi rarity. He joined Twitter last month and sent his first selfie last week. He has been endorsed by one ultra-Orthodox branch, while the two others have backed career bureaucrat Moshe Lion, a non-haredi, a candidate opinion polls put in second place. What a sham! A religious jew running in the apikorsishe medinah. Better the luny left than an orthodox jew. You shld bury ur head in shame. Such a weird rant by poster #1. The job of "mayor" is, as someone once pointed out, garbage and sewage - both figuratively but especially literally. The Talmud itself gives advice not to live in a city which is run (what we call today a "mayor") by someone who is a Talmudic scholar, and the explanation given is exactly because they are so otherwise distracted that they cannot pay attention to their duties.